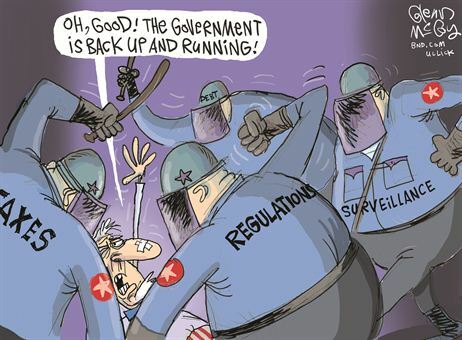 Contrary to the cartoon above, it’s not back up and running, though tax withholding and the impacts of regulatory rules continue unabated, and almost assuredly surveillance as well. After all (! ), the federal government shutdown affects only “nonessential” activities of the federal government. Federal workers who are furloughed will receive back pay when the partial shutdown ends, but for now, federal spending is down roughly 25%. The very real inconveniences for furloughed workers are regrettable. TSA employees continue to work while their paychecks are deferred indefinitely, though rates of absenteeism are high. So, we have slowdowns in security lines at airports, a lack of services at national parks (at least those not managed by private firms collecting revenue from visitors on-site), and a variety of other disruptions. For the time being, however, the lives of most Americans are largely unaffected. Except for the news coverage, my life hasn’t changed in any way, though I haven’t traveled during the shutdown. Unfounded rumors about the shutdown have been rampant. For instance, I’ve heard that Social Security checks and weather forecasts would be suspended. Nancy Pelosi said the Secret Service would be unable to protect the President at the State of the Union address in the House chamber, a statement which the Department of Homeland Security promptly refuted. Many of the federal agencies with the highest shares of furloughed employees are regulators whose services are arguably counter-productive. The White House Council of Economic Advisors (CEA) estimates that each additional week of the shutdown will reduce first quarter GDP growth by 0.13%. That means the interruption would take about 0.5% off first quarter growth if it lasts through January (say, from an annual rate of 2.5% to 2.0%). To the extent that people view the shutdown as temporary, and most do, the so-called “multiplier effects” of the shutdown should be relatively minor. GDP is intended to measure of the value of the economy’s physical output. It is calculated in two independent ways based on 1) all income earned, and 2) the total of all spending on final (not intermediate) goods and services. Most components of final spending are well defined by the values assigned to goods and services traded in markets. Likewise, most incomes are based on the value assigned by labor markets to a given productive effort. Government “output”, however, is rather suspect as a component of spending because it is generally not subject to a market test of value. On the income side of the ledger, do government workers produce actual outputs? Some do, of course, but those outputs cannot be measured except by assigning a value based on what the workers are paid, and the payer is spending other peoples’ money! It’s not too speculative to suggest that the government’s output is a fraction of its spending. If that’s the case, the actual reduction in output caused by the shutdown is much smaller than the measured reduction in GDP. Therefore, the CEA’s estimates are a fiction. To put an even finer point on it, many nonessential functions absorb resources while contributing very little to the nation’s wealth. Adam Brandon and John Tamny assert that private economic growth gives us the luxury of a large government sector, not the other way around. Government absorbs resources when it spends, but only by virtue of the taxes it imposes on private activity that is otherwise more highly productive. In the long run, as Brandon and Tamny argue, a smaller government (given a permanent shutdown of certain functions) might well yield greater economic output, not less. “They do nothing that warrants punishment and nothing of external value. That is their workday: errands for the sake of errands — administering, refining, following and collaborating on process. ‘Process is your friend’ is what delusional civil servants tell themselves. Even senior officials must gain approval from every rank across their department, other agencies and work units for basic administrative chores. Process is what we serve, process keeps us safe, process is our core value. It takes a lot of people to maintain the process. Process provides jobs. In fact, there are process experts and certified process managers who protect the process. Then there are the 5 percent with moxie (career managers). I haven’t even mentioned the debate over open borders and the proposed wall, but that’s not my purpose here. All parties to that debate seem to think the shutdown is unlikely to harm their side politically. That’s either because the shutdown isn’t perceived as very impactful, or the “other” side can be blamed. One theory making the rounds is that the shutdown is part of a larger plan to institute permanent Reductions in Force (RIFs) at federal agencies, which are permissible after a furlough of 30 days or more (by January 19th). The argument plausibly suggests that some federal agencies might operate more effectively once the bureaucracy is pruned back via furloughs and/or RIFs. That’s especially true if “deep-state” sabotage of efforts to roll-back regulations are as common as the author asserts. Is the shutdown therefore a trap for unsuspecting congressional Democrats? Who knows, but to my way of thinking, government RIFs might even be worth the trouble of building a wall! April 22: Happy Human Achievement Day! The future is ours to create. A Commonwealth immigrant's perspective on the UK's public arena. Exploring Ayn Rand's revolutionary philosophy. Economics, chess and anything else on my mind. Musings on science, investing, finance, economics, politics, and probably fly fishing.